In order to best prepare for oil and hazardous material spills originating from either Indiana, Kentucky or Ohio, along the Ohio River (including its tributaries) between Ohio River mile marker 401.3 to 531.5, an interagency team comprised of representatives from the U.S. Environmental Protection Agency (U.S. EPA), U.S. Coast Guard (USCG), Indiana Department of Environmental Management (IDEM), Ohio Environmental Protection Agency (Ohio EPA), Kentucky Department of Environmental Protection (KDEP), the Ohio River Valley Water Sanitation Commission (ORSANCO) and other federal, state, local agencies, and private sector, identified the need for a specialized planning document that would: 1) describe the roles that agencies and other entities would likely play in an incident, and 2) give responders a mechanism to help organize both in advance and during a response. This planning tool would also help multiple agencies to coordinate their operations and resources and make effective and efficient use of their personnel, supplies and time. The objective is to promote timely and effective coordination among the entire spill community, including Federal, state, local and private entities in response to an oil discharge or hazardous substance release along the Ohio River – Cincinnati Area (Ohio River mile marker 401.3 to 531.5) or within a major tributary leading to the Ohio River. The scope of this document involves discharges of oil into or on the navigable waters of the U.S. and releases into the environment of hazardous substances and pollutants or contaminants that may present an imminent and substantial danger to public health or welfare. To help meet these needs, the enclosed Response Checklist and initial Incident Action Plan (IAP) document was created in 2012. 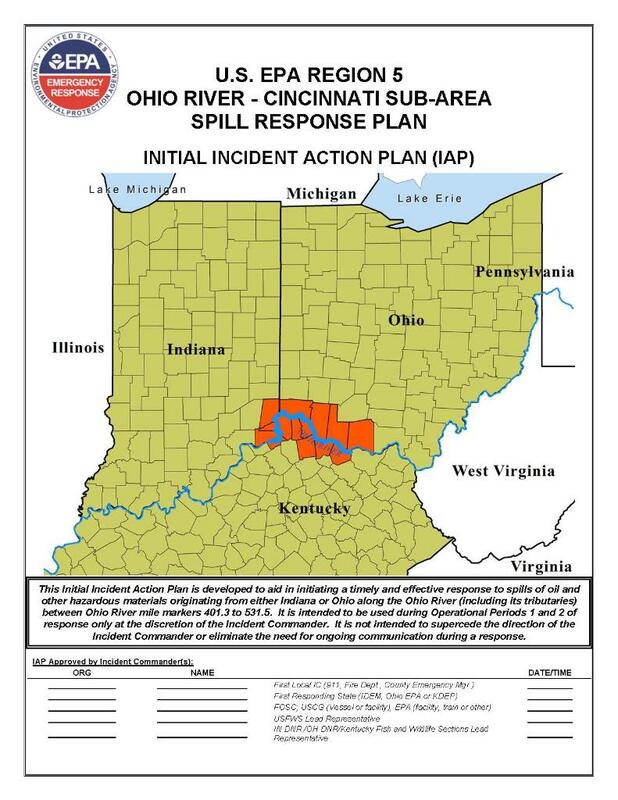 The plan has been tailored to identify the Incident Command System (ICS) forms most likely to be initially used in an Ohio River response and includes potential objectives as well as a detailed emergency contact list. The plan provides a concise and coherent means of capturing and communicating the overall incident priorities, objectives and strategies in the context of both operational and support activities. The response plan was developed to aid the implementation of the ICS. During an incident, the ICS emphasizes orderly and systematic planning, and this Response Checklist and initial IAP are intended to be the central tool for planning during the Operational Period #1 of response at the discretion of the Incident Commander (IC). The plan is not intended to supersede the direction or authority of the IC, or to preclude communication or flexibility in response. The level of detail required in an Incident Action Plan will vary according to the size and complexity of the response. After the Operational Period #2 of an incident, it is expected that this IAP will be superseded by a response specific IAP as needed. The response plan was developed to be consistent with, and support, existing plans and procedures including the U.S. EPA Region 5 RCP/ACP, U.S. EPA Region 4 Ohio River Response Plan, Mill Creek Response Plan, state response plans and local response plans. A 2017 Response Plan Update was distributed and posted to this web site. See Documents Section.